A quick guide to Community Development Financial Institutions: How they work and whether they can help you get money to start your business. Starbucks CEO Howard Schultz has quite a megaphone. When Schultz decided to launch a campaign to spur job creation it was good news for both America's unemployed and the nation's network of CDFIs. Starbuck's Create Jobs for USA Fund launched Nov. 1, 2011 and has thus far raised $7 million for CDFIs, which are lenders that help small-business owners in underserved communities gain access to capital. Starbucks accepts donations for the program both at its coffee shops and online. Of the money raised, $5 million is from the Starbucks Foundation and $2 million from public donations. People who donate at least $5 get a red, white and blue wristband with the word "Indivisible" printed on it. So far, Starbucks has distributed 500,000 wristbands. 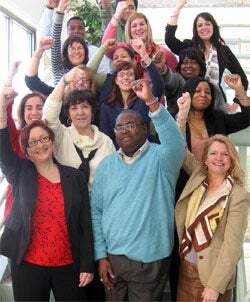 Employees of the Wisconsin Women's Business Initiative Corporation wearing their Create Jobs for USA wristbands. Employees at the Wisconsin Women's Business Initiative Corporation wear their wristbands, says Wendy K. Baumann, president of the Milwaukee, Wis.-based CDFI, which received a $20,000 grant from Starbucks' program. "Our funding came in December," says Baumann. "The money goes into actual loan dollars [for business owners]. It goes into our pooled loan fund." If you're a business owner seeking capital, CDFIs might be a good option, especially considering the current lending landscape. The approval rate for small-business loan requests at the nation's largest banks--more than $10 billion in assets--fell in 2011, to 9.7 percent in December from 12.8 percent in January, according to Biz2Credit, an online credit marketplace in New York that connects small and midsize businesses with lenders. Meanwhile, the approval rates for alternative lending sources, including CDFIs, rose last year, to 62.2 percent in December from 49.3 percent in January. Staff at The Trailside: Chef Frank Sommerfield, Chef Nick Moore, Bartender Laura Rice, Server Michele Mignerey, Pub Manager Karen Potts, and Owner Rod Darby (from left to right). A CDFI loan was a lifesaver for Ron Darby, owner of The Trailside, a biker-friendly convenience store, restaurant and pub in West Newton, Pa., along the rails-to-trails Allegheny Passage. Darby decided to buy The Trailside in December 2006 after a layoff ended his 27-year career as a computer salesman. He took the business plan for the store to banks of all sizes, but couldn't get a loan. Finally, he was advised to seek out The Progress Fund, a CDFI east of Pittsburgh. The Progress Fund has provided or facilitated funding of nearly $400,000 for Darby. Without it, "more than likely, I would be selling computers for somebody," says Darby says. Not only is The Trailside good for Darby, but it also has helped the local community. Since Darby bought the business in December 2006, the number of employees has grown to 25 from six. What is a CDFI: It's a private financial institution that makes loans in low-income, disadvantaged, and underserved communities at competitive rates to small businesses, nonprofit organizations and microbusinesses that may not be able to get credit in the conventional marketplace. CDFIs receive money to lend from a number of sources, including the federal government, state and local governments, religious institutions, foundations and individuals. Some CDFIs also help individuals purchase homes. The CDFI Fund, run by the Department of the Treasury, was established in 1994 and makes awards to CDFIs in the form of loans, grants, deposits or equity investments. Financial institutions must apply for status as a CDFI and meet certain requirements, such as serving specific geographic regions, offering economic education or counseling, and having a central mission of improving the community. There are nearly 1,000 CDFIs in the U.S.
Who qualifies for funding: Typical CDFI clients are small-business owners who have tried to obtain traditional bank financing, but either have been rejected or haven't been able to get enough capital. "We judge the person, rather than the person's balance sheet," says David Kahley, cofounder and CEO of The Progress Fund. "There are good people out there that can run good businesses that can't get a loan because they don't have the personal worth yet that makes the bank comfortable." How to apply: First, determine if there is a CDFI in your area. In addition to running a Google search, you can try the Opportunity Finance Network or the CDFI Fund which have useful search engines to locate lenders. If you find a CDFI in your region, be prepared for a different sort of application process than you might expect at a bank. "There is lots of face time, sitting down talking, and help and suggestions and advice," says Kahley. "This is not applying for a credit card: Get online, compare rates, push a button. Small business lending is a journey." Why it's worth the effort: If your credit score has been hurt, you have had to declare bankruptcy, or you have never started a business before, it may be next to impossible to get financing and a CDFI could be your only option. "We try to meet them where they are, with what they walk in with," says Mark Pinsky, president and CEO of the Opportunity Finance Network, which represents about 180 member CDFIs. That philosophy translates to the bottom line. CDFIs "are profitable in that they are profit making but not profit maximizing," he adds. A loan from a CDFI also means more than just a check. "The other half of what we do is business education," says Baumann of the Wisconsin Women's Business Initiative Corporation. Baumann and her team help business owners with marketing strategies, cash-flow management, accounting, business plan review and employee training. Drawbacks: Interest rates on CDFI loans typically run higher than bank rates, according to Rohit Arora, CEO of Biz2Credit. The rate on a business loan from a bank will likely run between 3.25 percent and 5 percent, he says. But most of the CDFI loans he sees carry rates of 7 percent to 8 percent. "They will be somewhere in the middle between the loan sharks and the traditional banks," Arora says. Also, CDFIs don't have the resources to lend as much money as banks. Very few will make a loan above $500,000, Arora says. What's more, it can take two to four weeks longer to obtain a loan from a CDFI than from a bank. Finally, Arora says, CDFIs often lack the online tools that banks offer customers.